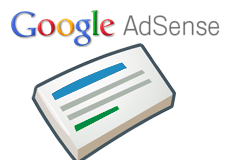 I spotted a thread at WebmasterWorld where a publisher said that Google was testing showing AdSense units without the arrows. We actually saw this in action in mid-November. But when I was testing for this, I saw Google repeatedly show square graphics/images at the beginning of the AdSense unit. The graphic seems to be some generic clip art and makes the ad unit look pretty ugly. I believe Google has tested this in the past, but here are some pictures.